Thanksgiving is like a whole season for us. We start taking orders for our fresh turkeys the day after Labor Day. We have turkeys ranging in size from 14-45 pounds. We take orders in size groups. This year’s size groups are: 14-16, 17-19, 20-22, 23-26, 27-30, 31-35 and 36+. Our turkey price for Thanksgiving 2018 is $3.59 per pound. You should plan on a pound to a pound and a half per person plus leftovers… so for example, if you are having 12 people, you could order a 17-19 or a 20-22 depending on how much you want left over. Once you order your turkey, you wait until the week of Thanksgiving to pick it up! Pick up days are Monday, Tuesday and Wednesday before Thanksgiving. Monday and Tuesday we are open 8 am-7 pm. Wednesday we are open 8 am-6 pm but turkey orders are only held until noon on Wednesday. We recommend coming Monday or Tuesday for the best selection within your size group. We also have home baked pies, homemade gravy, beautiful produce, baked goods, stuffing mix and other yummy stuff for your gathering! 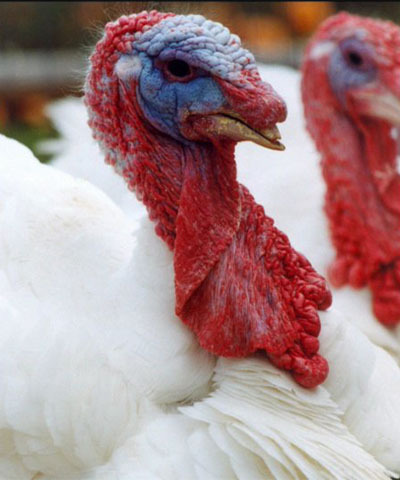 Please see our Turkeys page for more information on how we raise our delicious birds!